Here I am again with a toy review for a character I know nothing about. Maybe I should start titling these “Vault’s Clueless Reviews”. 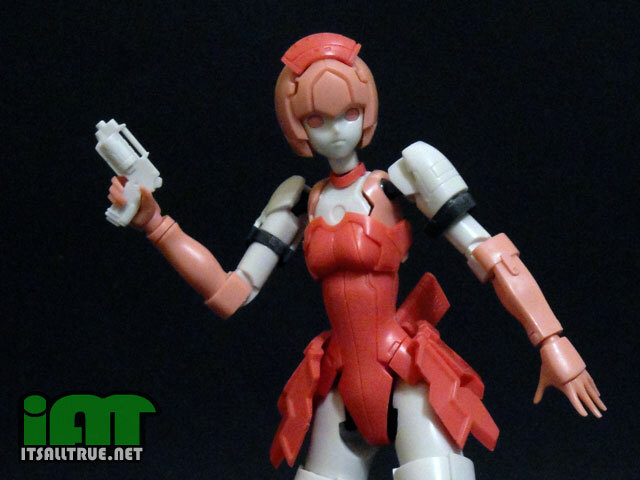 But do I really need to know anything more about this RAcasael Elenor figure other than that she’s a super cute robot girl? Nope. Besides, that’s what the review is for. I’ve always been a fan of robot girls, but it wasn’t until recently that I discovered a sever lack of them in my toy collection. It’s hard enough to get a good female action figure from US companies sometimes. When you narrow down the list to female robots, you’re pretty much just left with a few Transformers and EVE from WALL-E. I knew this, but it was never an idea I really thought about. There were just not fembot toys, and life went on. Then I discovered the wonderful, and expensive, world of Japanese import toys. At first I was mostly distracted by all the nifty Kaiju figures that Revoltech was debuting. 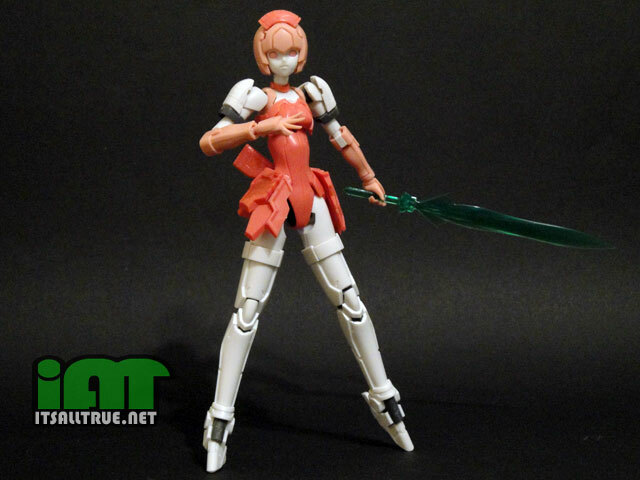 But, as I kept my eye on the upcoming pre-orders, I noticed figures of robot girls would pop up quite often. If you ever wondered why I started buying figures of characters I know nothing about, it all started right here. 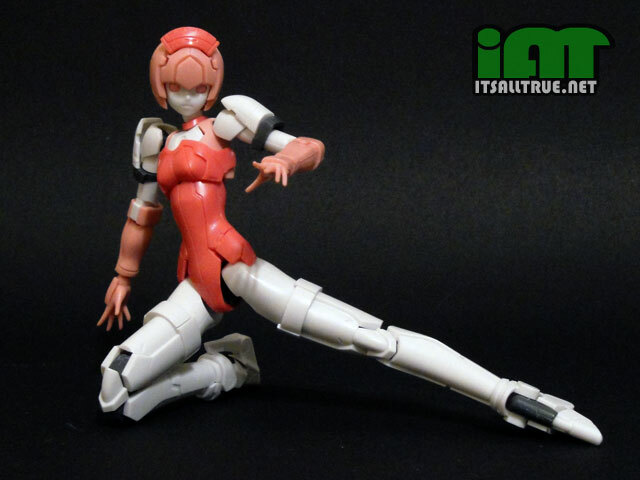 Figma revealed their Drossel figure and I realized what had been missing from my toy collection for all these years. This brings me to my newest addition to my fembot collection, RAcaseal Elenor from Phantasy Star Online. A 1/12 scale “Full action plastic kit” produced by Kotobukiya, and sculpted by Masaki Apsy. What does that mean? This figure is actually a model kit. All her pieces come on sprues and you have to assemble her. But when finished, you’re left with a fully poseable figure instead of a static model. I’ve seen this done with Gundams before, but this is my first time seeing it applied to a non-Mecha. So you Phantasy Star fans will have to fill us in on what we’re missing. Like I said, this is the first time I’ve assembled one of these kits, so I didn’t know what to expect. Luckily for me, these kits are designed with the amateur in mind. Every sprue was designated by a letter, while the pieces on the sprue each had designated numbers. There was no confusion with what piece I should be working with. Also, almost all the pieces snap together or are held in place. The only real need for glue was on her holding hands, which are three pieces and need to be a little more secured to actually hold things. Thank you for sharing, Vault, that’s pretty nifty looking! Yeah, I think just the plastic by itself looks fine, altho maybe a light wash of black or gray (on the ‘clothing’ sections only, mind) might make the detail pop. Knowing nothing of the chara or the game all I can add that she looks like she’s dressed in an Anne Miller waitress uniform (one of the top ten fetish outfits in Japan) and the coloring echos that. Vault, did you pick up the ’60s Gamera and Gyos Revoltech figs? they look awesome! I haven’t picked up Gamera and Gyos yet. It was a big disappointment to me that they aren’t doing the Godzilla figures. So I’m not really sure what I’m doing with the Revoltech kaiju yet. As they say, hate the game, not the player. If Toho want to be massive buttheads with the licensing, let them. You need Gamera and most especially the Gyos. you know what makes me laugh? you just assembled a whole figure based on the pieces that come on the sprues, and a picture diagram w/ the letters of the sprue on them… and joe amaro was, a couple months ago, defending mattel’s “shouldergate” issue w/ king hsss because these poor workers have to take pieces off sprues and assemble them. yep, sure seems like it stymied you! i’ve done about a dozen assorted model/figure kits over the last several years, and never had problem one. not a single instance where goku came w/ two shoulder sprue for the same shoulder, no problem putting the left hand on the left wrist, etc… so why can model kits make it to me accurately, and be easy to assemble when they arrive, but a multi-million dollar company can’t find employees who can assemble them correctly on site? May have to get one – she looks like she could be an Arcee custom that even I could do – and will save paying out big bucks for a 3rd Party Crappy knock-off just to have one that can stand with my other TF Generations guys. Yeah, I can see her easily becoming an Arcee. One of the reason’s I originally ordered her was to mod into a Dorothy from Big O. Luckily, they started making Big O figures, so I didn’t have to bother. actually motor, i must say, most of the TF fans i’ve spoken too that are buying the third party products have told me the quality is as good and frequently better than the mass produced hasbro pieces. i’m sure there are horror stories out there, but there are some very happy customers too. 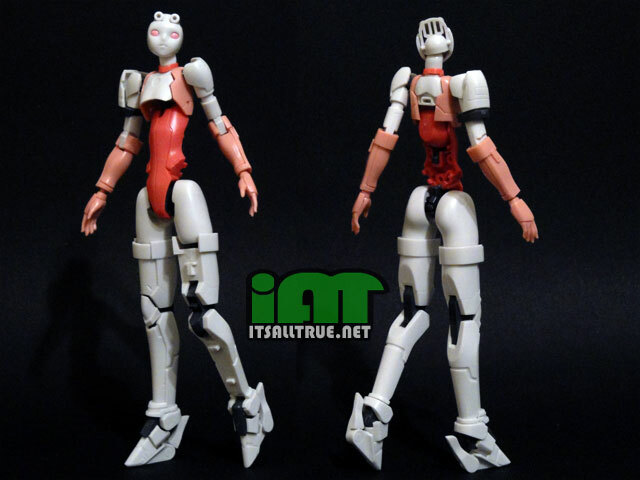 I don’t mean to alarm you, but I think you might own a Derpcel rather than a Drossel– that is, a bootleg Drossel. However I don’t know enough about the figure to say for sure, but it’s worth looking into as they are unfortunately pretty common. Nah, she’s legit. That’s just a bad picture of her. Check out her review, you’ll see those accurate details. It’s hard to find any more info on them, though, as it mostly comes from “website that shall not be named”. Way back in 1998 I built a model of a Rockman X Irregular Hunter that was actually a couple years old at the time. I am still amazed that I so easily built a small, well-articulated action figure. This was over 10 years ago and it’s still an amazing little piece. My, what those Japanese are capable of. Your little robot looks to be designed and engineered even better and have better articulation. That pose where she lies on her stomach is very hard for most figures to achieve. It looks like a pretty amazing little toy, and like you, I am all about little amazing toys, even of characters I know nothing about. Amazing toys are always nice to have. I’ve got a second model kit/action figure coming from a different company for a Virtual On character. I’m curious to see how she compares with this one.